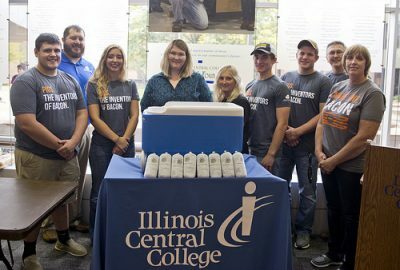 The Illinois Pork Producers Association (IPPA) and the Illinois Central College Agriculture Program have teamed up to provide the ICC food pantry with a donation of ground pork. Pork Power: Partnering to Fight Hunger in Illinois, is a donation program made possible by contributions from Illinois pig farmers, the Illinois Corn Marketing Board and Illinois Soybean Association Checkoff Program. Professor Grant Grebner’s animal science class and the ICC Agri-Business Club have collected donations from students to purchase ground pork from Chenoa Locker, Inc. IPPA is proud to support the agriculture students’ campaign by matching the funds raised. In turn, the ground pork was donated to the College’s food pantry to benefit fellow students who need quality protein. Pam Janssen, pig farmer from Minonk, is proud to be part of the equation. “I am excited to host the AGRI 110 class at my farm in October for a lab and allow them to get hands on experiences with pigs,” said Janssen. This will be her tenth-year hosting Grebner’s class at her family’s farm. Janssen is the Vice President Elect for the Illinois Pork Producers Association and helped make the connection between ICC and the Pork Power program. Grebner has provided a full-circle learning experience for his classes over the years, specifically related to pork production. Knowledge has been learned in and out of the classroom by providing field trip opportunities to see farms in action. After completing the pork donation to the foodbank, students have learned the value of raising healthy pigs and growing a quality pork product that benefits their local community. Since its inception in 2008, Pork Power has generated over 625,000 pounds of pork – enough for nearly 2.4 million meals – for families throughout Illinois. Pork, soybean and corn farmers commit funds from their respective checkoff programs to support this campaign. Illinois pig farmers are proud to help their neighboring communities. ICC began its affiliation with Midwest Food Bank and Kwikee in 2017, which led to the ICC Food Pantry being established soon after. The service to students was established under the belief that no one should ever have to choose between pursuing their education and purchasing food. The Pantry is administered by the Student Services Department on the East Peoria Campus. In the month of September 2018 alone, there were 273 visits to the Pantry. Pantry hours vary, depending on campus location. The East Peoria Campus hours are noon to 2 pm Monday through Friday. Peoria Campus locations vary. Assistance also is available outside of normal hours by visiting the Dean of Students Office or the Advisement and Counseling Center on the East Peoria Campus.